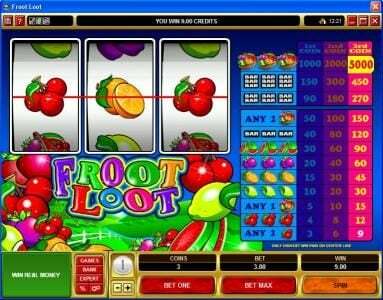 Froot Loot online slot machine pictures and slot feature list from Microgaming, play Froot Loot Slots for free. 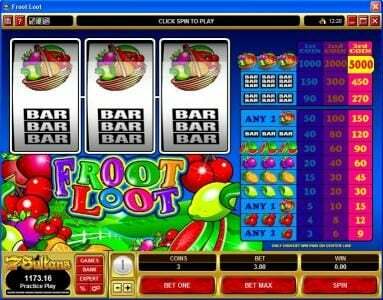 Froot Loot Slots has not been reviewed yet, be the first to rate this slot. 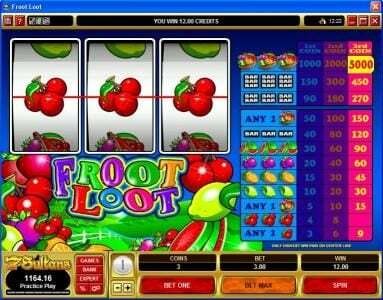 Froot Loot is a 3 reel, 1 payline classic slot game created by Microgaming. This game has a maximum jackpot of $25,000 and a scatter symbol as well. The theme of this game is clearly fruit and the slot symbols resemble the theme of this game. Some of the symbols you will see include lemons, plums, fruit baskets, cherries, oranges, melons and three different bar symbols as well. These symbols will provide you with profitable winning combinations. The wagering options for this game range from $0.25, $0.50, $1, $2 and $5 dollars. You will be able to wager up to three coins per spin making the maximum wager $15. You will also be able to wager in Euro's, Pounds and Dollars. You will only be able to win the five thousand coin jackpot when you are wagering thing coins. When you play one coin the jackpot is one thousand coins and when you are using two coins the jackpot is two thousand coins. This is a classic slot game and as such there are zero game features included within it. This is a good thing though because it allows you to truly experience the classic slot game for what it is. Where this slot becomes valuable is the larger coin wins its offers. This increases when you are playing more than one coin and only improved the potential that Froot Loop truly offers. Classic slot games aren't for everyone due to the fact that there aren't any game features but if you love a simple Casino game that can provide you with some large wins then this classic Slot game is the game for you.